Explanation: Swinging inside the orbit of Mercury, on April 20th periodic comet Encke encountered a blast from the Sun in the form of a Coronal Mass Ejection (CME). When CMEs, enormous clouds of energetic particles ejected from the Sun, slam into Earth's magnetosphere, they often trigger auroral displays. But in this case, the collison carried the tail of the comet away. The tail was likely ripped off by interacting magnetic fields rather than the mechanical pressure of the collision. 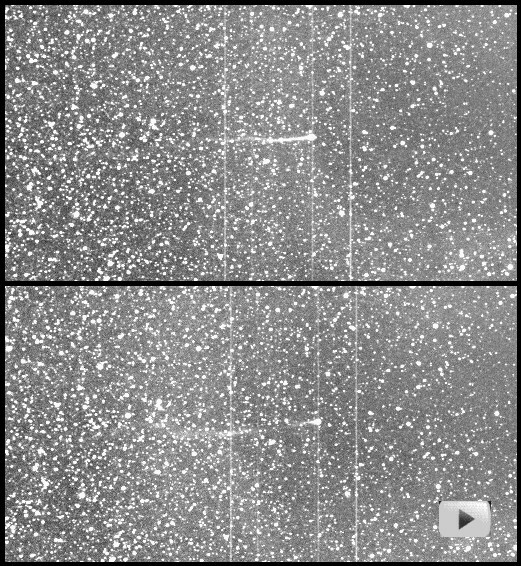 Clicking on the two panel image will play a movie gif of the remarkable event as recorded by the Heliospheric Imager onboard the STEREO A spacecraft. In the movie, the time between frames is about 45 minutes, while the frames span about 14x20 million kilometers at the distance of the comet. Of course, similar collisions have happened before as the ancient comet loops through its 3.3 year solar orbit. So don't worry, Encke's tail grows back!